This recipe uses 4 small ice lolly moulds. 1. Soak cashews in hot water for 1 hour. 2. Combine almonds, dates and salt in blender until finely ground, then set to one side. 3. For the cheescake mix, place cashews, lemon juice, coconut oil, agave syrup and vanilla extract in blender and blitz until smooth. Set to one side. 4. 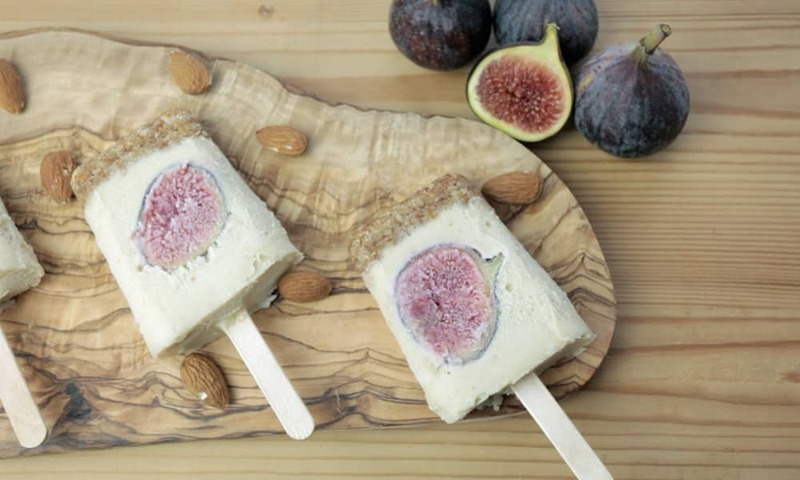 Cut figs in slices as wide as the mould. 5. Evenly distribute the base mix at the bottom of each mould, then pour one tablespoon of cheescake mix, followed by one slice of fig, and finally top with cheescake mix. 6. Gently tap the mould to remove any air bubbles. You can use one of the wooden sticks to gently move the cheescake mix and remove any difficult to reach air bubbles. 7. Freeze for 4-6 hours or overnight. 8. Remove from freezer and leave to soften for 10 minutes before removing from the moulds. If required, pour hot water over the moulds to help loosen the pops.